Videocon Solar Hybrid AC effectively works during the day without electricity and provides exceptional cooling. At night, the solar grid enables the inverter battery to save the solar energy for the AC to run seamlessly. The Solar Panels come with a linear power output warranty of 25 years & 10 years of Panel Warranty. Videocon has rolled out 2 new models in the Solar Hybrid AC range. Both the models comply with BEE star ratings and possess 5 stars, making them a certified power saver. These are available across 1 ton and 1.5 ton. The AC comes with R-410A refrigerant and also has additional features such as digital display, auto restart, turbo cool mode, copper condenser, etc. making it the most worthy purchase. 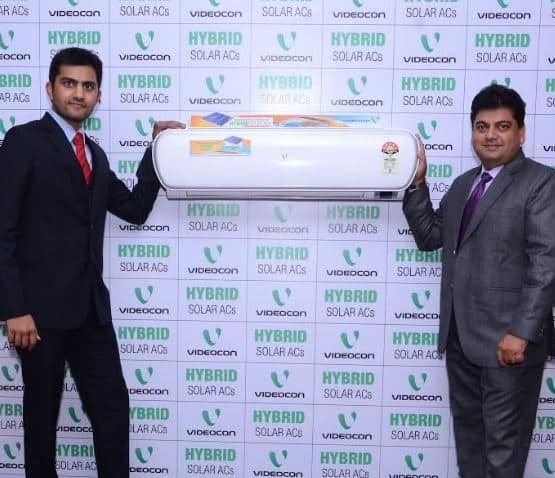 Videocon will also be coming up with a special 360° advertising campaign for Solar Hybrid ACs that would be spread across all major media, to build top of mind recall. Unique product display will be created for the ACs which will be further enhanced with a strong service support provided by the operations team at Videocon. With the successful launch of the Hybrid Solar air conditioner, the company has plans to make its entire AC portfolio compatible with solar energy. With this new outlook, Videocon looks forward to a greener living world for a sustainable ecosystem. Price range (MRP): o 1.0 ton, 5star rated Videocon Hybrid Solar AC will be available for MRP Rs. 99,000* o 1.5 ton, 5star rated Videocon Hybrid Solar AC will be available for MRP Rs. 1,39,000. The given price includes AC cost, DC-AC Inverter, Solar Panels & Installation. What is the economics, that i is cheaper than electric powered Air conditioner? Where we can buy a,?